I have a problem. I’m a beer hoarder. I’ll see a limited release or one-off beer at the beer store and I’ll buy it. I may not have any plan to drink the beer any time soon, but the thought of missing out on what could be my favorite beer of all time is too much to pass up. That being said, I’m going to start cleaning out my “beer cellar” and writing reviews of these beers. Here’s beer number 1. 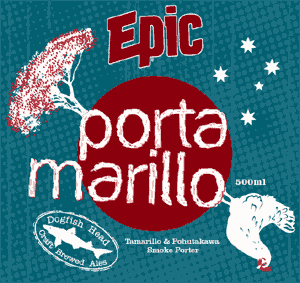 PORTAMARILLO is a collaboration beer brewed by Delaware’s Dogfish Head Craft Brewery and the folks from Epic Brewing Company out of Auckland, New Zealand. 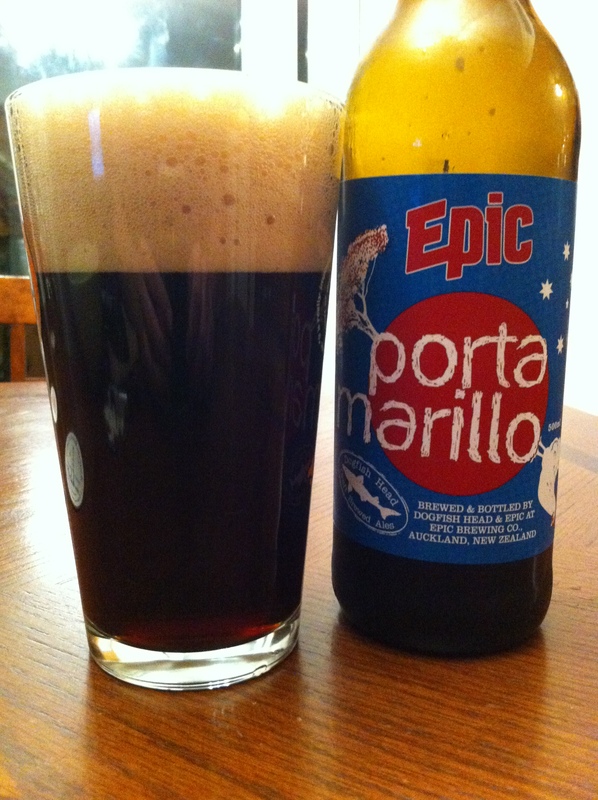 This American Porter was brewed has a 7% ABV and was brewed using the New Zealand native tamarillo fruit. For the collaboration, Luke Nichols of Epic came to Dogfish in June of 2010 for the intial test batch (we brewed it in our Rehoboth Beach, DE brewpub). An Imperial sorta-porter fermented with Brazilian Rapadura sugar and a couple of really unique New Zealand ingredients. To make the Portamarillo we first grilled tamarillos (sweet, fruity NZ tomatoes) over Pohutakawa wood at our pub then pureed and added them to the boil. Luke sourced this unique wood for us from his motherland – Pohutakawa has found an important place in New Zealand’s culture, both of the European settlers and Maori – being venerated for spirituality, strength and beauty. The wood and tamarillos do truly add a smoky, fruity, roasty beauty to this beer. The beer pours a deep chestnut brown with tan highlights along the bottom and sides of the glass. A massive root beer-like foam floats atop the beer and stays there for a while. Lacing is mild, but only sticks around from sip to sip. I’m going to start this part of the review by stating that I’ve never had a tamarillo before. This naïveté will most likely affect my review. The nose starts with raisins and molasses. Cherry cordial (chocolate, cherry, and booze) and malts are close behind. There is a slightly sweet dark fruit scent in there that I imagine is the tamarillo fruit. A faint touch of brandy was noted throughout. The cherry cordial flavor takes center stage in the taste. Roasted grains appear in the middle, with a finish of pear and apricot. The brandy flavor is present here as well and grows as it warms up. Mouthfeel is medium to light with some noticeable carbonation. Minor residue is left behind, but nothing too disturbing. The warming process adds creaminess and heft to the feel of this beer. I sat on this beer for a while before drinking it. Maybe too long. It’s hard to say since I don’t know what tamarillos are actually supposed to taste like. What I got was a slightly boozier than average porter with some fruit here and there. I wouldn’t order it again, except to try it fresh.